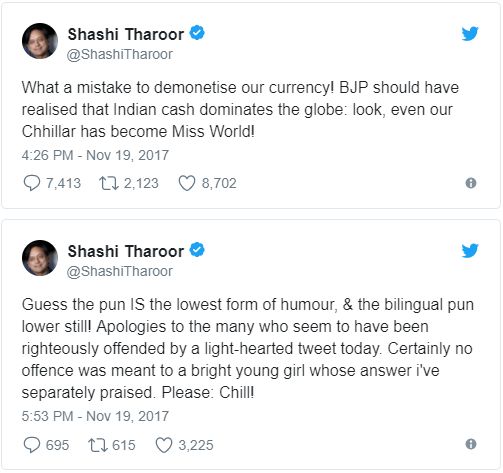 Shashi Tharoor who is a Congress minister tweet at the expense of Miss World 2017 Manushi Chhillar’s name while taking a dig at the BJP’s demonetization move, the winner of the prestigious crown. 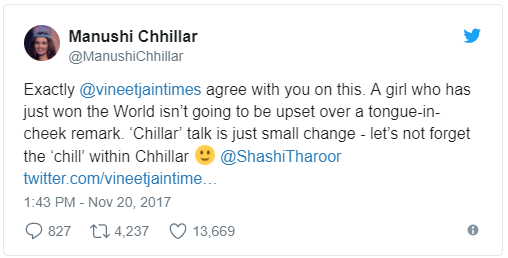 Miss World Chhillar, who is a medical student, was responding to a tweet by Times Group MD Vineet Jain. “I saw @ShashiTharoor tweet regarding @ManushiChhillar . I wasn’t offended even though she is a times girl. We need to learn to be more TOLERANT towards light hearted HUMOUR. #MissWorld2017 #MissIndia,” he’d tweeted. The academician appreciated Chhillar’s easy-going attitude towards the tenor of his tweet and called her a “class act”. “You’re a class act, @ManushiChhillar! Beautiful, smart & uncommonly gracious too. Still, if any offence was caused to any member of your family, sincere apologies. Like every Indian, I’m proud of you,” he tweeted. 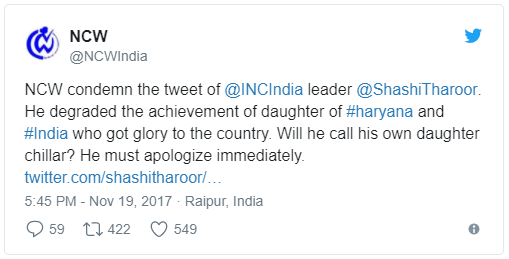 Tharoor’s initial tweet was also lambasted by several ministers including two Haryana ministers and the National Commission for Women. In fact, the NCW on Sunday said it would summon Tharoor for his “derogatory and degrading tweet”, made by the Thiruvananthapuram MP after Chhillar was crowned Miss World. “He degraded the achievement of daughter of #haryana and #India who got glory to the country. Will he call his own daughter chillar? He must apologize immediately,” the NCW tweeted.